WASHINGTON (AP) — President Barack Obama's choice for the Supreme Court prepared for his initial courtesy calls with senators Thursday as Democrats began the next phase of their drive to put unbearable election-year pressure on Republicans refusing to consider any Obama pick. Merrick Garland planned to meet with two top Democrats, a day after Obama finally gave a name, face and judicial record to his effort to fill the vacancy left by last month's death of Justice Antonin Scalia. But even before Garland — a 63-year-old moderate, a top appellate court judge and former prosecutor — could hold his first meeting, the Senate's Republican leader indicated he would not budge from his party's refusal to consider a replacement for Scalia until the next president takes office in January. Stating what he called "an obvious point," Senate Majority Leader Mitch McConnell, R-Ky., said the two parties disagree over filling the vacancy and it is time for lawmakers to turn to other issues. "Republicans think the people deserve a voice in this critical decision, the president does not," he said. Garland planned to meet with Senate Minority Leader Harry Reid, D-Nev., and Vermont Sen. Patrick Leahy, top Democrat on the Senate Judiciary Committee, which considers judicial nominations. With the issue coloring this fall's contests for control of the White House and Senate, Democrats have spent weeks trying to link Senate GOP opposition to a court nominee to positions held by Donald Trump, the Republican presidential front-runner abhorred by many Republican leaders. 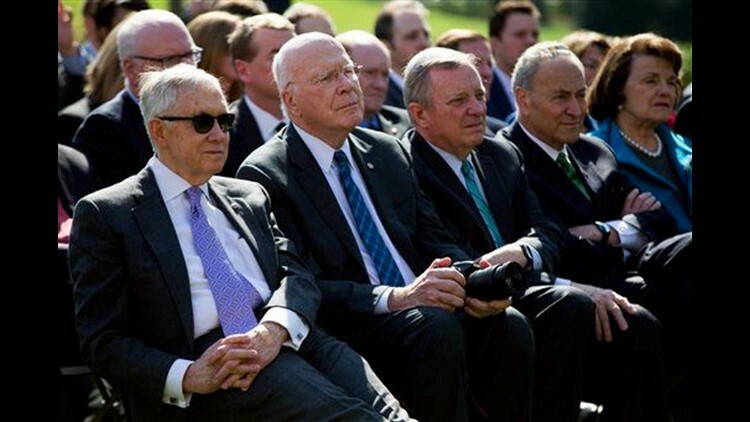 "Merrick Garland's name hadn't even been mentioned, yet Republicans were already resolved to undermine President Obama," Reid said about McConnell's opposition. "That sort of 'punch first, ask questions later leadership' is exactly what we've come to expect from Donald Trump," Reid said in a speech at the liberal Center for American Progress. He said McConnell "is sacrificing the Republican majority to allow Donald Trump to pick the nominee." The White House said that after a two-week Senate recess, Garland will meet with the committee chairman, Sen. Chuck Grassley, R-Iowa. Grassley has been a chief focus of Democratic attacks for refusing to let the committee hold a hearing for anyone Obama picked, helping to doom the nomination. McConnell has refused to meet with Garland. But the planned meeting with Grassley — which his aides conceded could occur — underscored a willingness by a small but growing cadre of GOP senators to say they'd see the nominee, and in some cases take the process even further. "I meet with anybody, and that would include him," said Sen. Jeff Flake, R-Ariz.
Flake said if a Democrat were elected president in November, he would want the Senate to consider Garland's nomination during a postelection, lame-duck session because "between him and somebody that a President Clinton might nominate, I think the choice is clear." Flake's comment showed how Obama and the leading Democratic presidential contender, Hillary Clinton, have had a good cop-bad cop effect on some Republicans, who consider Clinton likely to make a more liberal selection should she enter the White House. GOP Sens. Kelly Ayotte of New Hampshire, Susan Collins of Maine, James Inhofe of Oklahoma, Orrin Hatch of Utah and Rob Portman of Ohio also expressed an openness to meeting with Garland. Ayotte and Portman are among a half-dozen GOP senators in competitive re-election contests who Democrats hope will be pressured into backing hearings and a vote on Garland or be punished for their refusal by voters. Opposition by most Republicans means Garland's confirmation remains an uphill climb. One reason for the intense combat over Justice Antonin Scalia's replacement is that Garland would tilt the court's 4-4 balance in the liberal direction after decades of conservative dominance. Garland is chief judge for the U.S. Court of Appeals for the District of Columbia Circuit, considered just a step below the Supreme Court in its clout because of its jurisdiction over administration policy. A Harvard Law School graduate, Garland clerked for liberal Justice William Brennan Jr., an appointee of Republican President Dwight Eisenhower. As a federal prosecutor, he oversaw the investigation and prosecutions in the 1995 Oklahoma City bombing case and the case against Unabomber Ted Kaczynski. As a justice, Garland would be expected to take liberal-leaning views on environmental regulation, labor disputes and campaign finance. On criminal defense and national security cases, he's earned a reputation for a law-and-order streak, siding often with prosecutors. McConnell and Grassley were among five GOP senators still serving who opposed his confirmation to the court of appeals in 1997, while seven remaining Republicans voted "yes." "He may very well be very good nominee. I voted for him earlier," said one of those senators, Pat Roberts, R-Kan. "But it's not about the nominee. It's about the process." Associated Press writers Matthew Daly, Kathleen Hennessey, Mary Clare Jalonick and Josh Lederman contributed to this report. This story has been corrected to show five remaining GOP senators, not four, opposed confirming Garland to an appellate court judgeship in 1997.